Cool peppermint and rich chocolate join forces in these fudgy brownies topped with creamy icing and chocolate ganache. 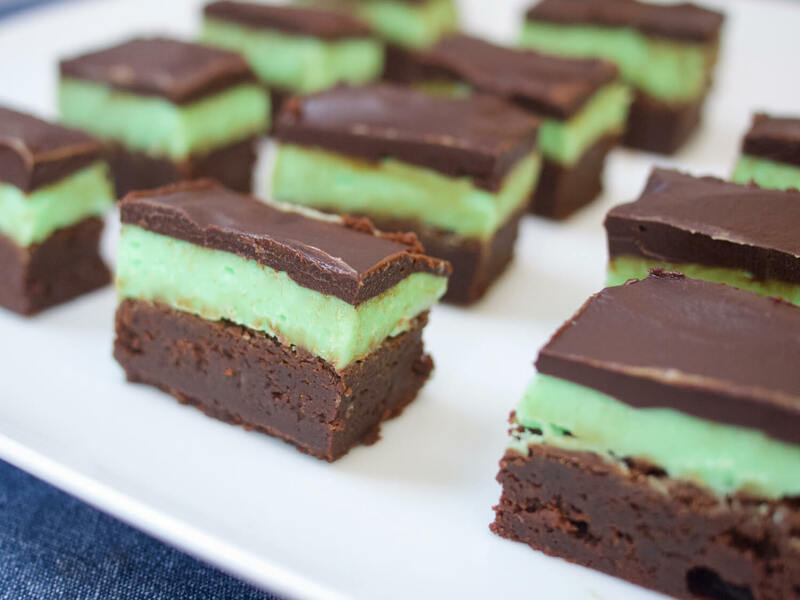 Peppermint and chocolate are a classic combination -- the deep richness of chocolate in these brownies is perfectly complimented by the cooling effect of Vanns Peppermint Extract. The hardest part about this recipe is waiting for the brownies to set before slicing! Heat the oven to 350°F and lightly grease a 9”x13” baking pan with butter. Line with a strop of parchment that fits across the width of the pan, leaving two ends sticking up above two edges of the pan for easy removal. In a medium bowl, stir melted butter, sugar, and salt together until evenly combined. Add cocoa powder and mix until smooth. Add eggs and mix until smooth. Add flour and baking powder and gently stir until just combined. Finally, add peppermint extract and stir until smooth. Pour batter into prepared pan, smoothing top with a silicone spatula or the back of a spoon. Bake for 20 minutes, until a cake tester or skewer inserted into the middle comes out clean. Remove from oven and cool in the pan on a rack until completely cool. To make the mint icing, place confectioner’s sugar, 6 Tbs. melted butter, peppermint extract, and milk in a bowl and stir until smooth. Add green food coloring, if desired, drop by drop, stirring after each addition until you have a minty green color. Spread glaze on top of fully cooled brownies and smooth with a silicone spatula or the back of a spoon. To make chocolate ganache, place chocolate and peppermint extract in a small bowl. Heat cream in a small saucepan or in the microwave until hot and starting to bubble. Pour cream over chocolate and stir until completely smooth. Allow to cool until still pourable but no longer hot, about 5 minutes, and then pour over the top of the brownies, smoothing with a spatula or the back of a spoon. Refrigerate until fully set, 1-2 hours before cutting, for cleanest slices. Slice a bit smaller than you'd think -- these brownies pack a flavor punch! Makes 24-36 brownies. Adapted from King Arthur Flour. These are the cookies that you should add to your stable of Christmas cookie recipes this year. You probably have most of the bases already covered - the classic iced sugar cookies, the beautifully spiced gingerbread, the buttery, crumbly shortbreads, the jam-filled thumbprints. Vanns Orange Extract adds a delicious hint of citrus to a classic chocolate magic shell. Don’t be scared. This isn’t a case of putting tofu where it doesn’t belong in the name of “health food,” though I will admit that this version of pudding does turn out to be much lower in fat than the traditional kind. Making dessert for a crowd can be difficult. Something like a pie is almost big enough, but you'll have to carefully dissect it into tiny slivers to really make it work. A layer cake looks spectacular, but presents the same slicing problem. Hummus isn't the only bean-based dip that's easy to make at home -- this red-lentil based spread is a vegetarian version of kibbe, a Lebanese dish that takes many forms, but always involves bulgur wheat and a mix of delicious spices. Subtle hints of classic pumpkin pie spices complement the sweet squash undertones of this perfectly-sweet pumpkin cheesecake. A simple almond frangipane elevates a rustic stone fruit galette.